Enhance a plain wall with two charming window shapes using these Esschert Design Window Frame Wall Mirrors with French Doors. 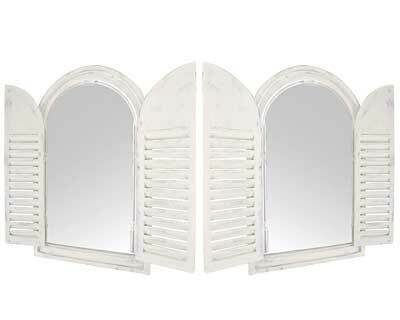 These two, timeless units affix to a wall in moments, and the arched shape and hinged shutters on each add a bold look to your home or patio. The shutters on each unit open outward, evoking French doors, and a mirror in the center of the frame completes each piece. A stepped design on the external frames brings dimension to your walls, and the distressed finish on the pine wood sections offers an aged look. The beige tone of each unit lends a beachside hint to any setting, and the plywood back with extra support slats provides strength. Use the attached, toothed hanger on each item to place them against a wall. The package of 2 allows you to flank a favorite photo, or is perfect for creating drama and interest on a bare wall. Add classic style to two walls easily with these Window Frame Wall Mirrors with French Doors. Note: This case pack contains 2 of the Esschert Design Window Frame Wall Mirrors with French Doors.